NFL Pick 'Em, Week 1: Win One for the Duke: The NFL season starts Thursday, so it's time to channel your inner Norman Chad and make picks each week. Choose the winners of each game, the margin of victory and up to one stone cold lead pipe lock. The winner will receive a prize (details inside). For this year's NFL Pick 'Em contest, SportsFilter is giving away a prize to the season's winner: An official NFL Game Football ($99.99 value). We're using the same rules as the CFL Chicobangs Memorial, with one twist. You can choose one game a week to be your Stone Cold Lead Pipe Lock. This triples the points you win for that game, but if that team loses, you lose 3 points. You're not required to pick a lock each week. If you need any extra motivation, this could be your last year to get an official NFL football with Commissioner Roger Goodell's name on it. 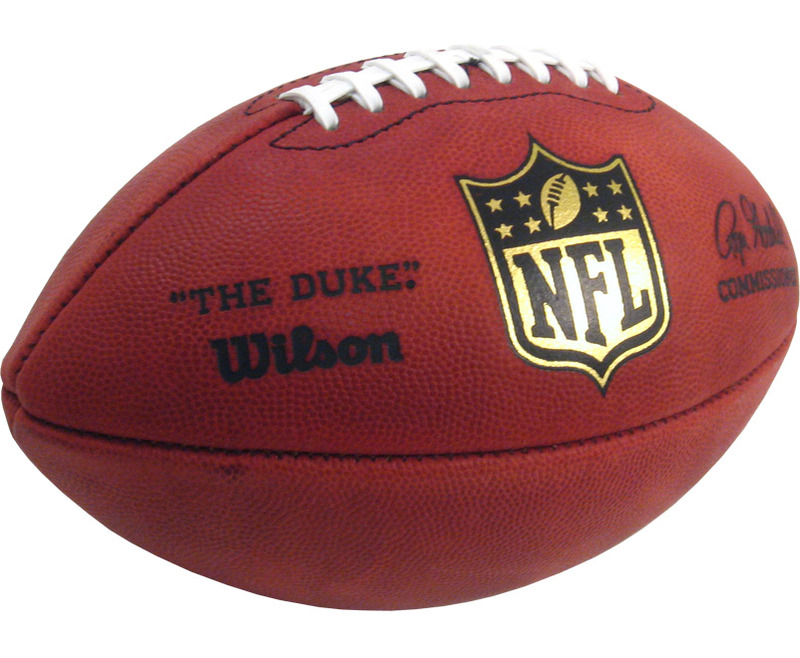 No guarantee express nor implied the football will have Roger Goodell's name on it. * - Lock of the week pick. Will the ball arrive fully and legally inflated? This ball will be taken into a private GIllette Stadium bathroom for 90 seconds. What happens there is between me, Judge Richard Berman and the Ideal Gas Law. Rules question: What should we do if someone picks a stone cold lead pipe lock and the team loses but the spread is correct? That game could be worth 0, -2 or -3, depending on whether nailing the spread gets you 1 point or not and whether it's tripled or not. I think the point triple only should happen in a win, making the game worth -2. I think, since we're picking straight-up, if you lose the lock, -3. Way too many teams to pick to make a dissertation on each. (I hear a chorus of "thank you, thank you, thank you" from the great unwashed.) I will proceed apace from here. I hope your Jacksonville pick is the product of the staggering prognosticative intellect you've displayed in the Chicobangs and not unswerving First Coast loyalty. Bold City needs a W.
Rcade--I hope so too/lol. This week, it's both. I really do think we'll win this week but, I have to admit, that I can not pick against them, regardless of the opponent, and whether I think they will win or not. In Bortles we trust. The tribe has spoken: Losing your stone cold lead pipe lock will always be -3, even when you hit the spread. In Blake Klingler O'Donnell Smith Mitchell Kitna Palmer Dalton we trust. Tahoemoj, I probably should tell you that I live just outside of Cincy (grew up here and was/is a Bengals fan), so maybe I'm part of a curse/lol. I worked as Jacksonville University's webmaster for six months in the 1990s. That's the gig that brought me to Florida from Dallas. First of all, anyone who leaves Ohio and is smart enough to abandon any vestiges of Bengals and/or Browns fanhood cannot be faulted. Not even a little bit. I have lived on the west coast for 21 years now, but am too stubborn (dumb?) to abandon my allegiance to the Bengals after living in Cincinnati for 20 years. When I think of how much more pleasant my last two decades would have been if I had just jumped on the Niners, Seahawks, Chargers, or even Raiders (ok, just kidding) bandwagon. But then after being smart enough to jump ship, you pick the Jags?! And stick with them, even with the Bengals reaching the pinnacle of almost being competitive?! If you're ever in Santa Barbara, I'll buy you a drink. If you're ever in Santa Barbara, I'll buy you a drink. I look forward to it. Though, you're probably in no real danger of having to buy it/lol.